There are different ways to initiate the composing of a new fragrance, but the spirit of it should always be one; “Kodo” the Zen of perfume. In the Hebrew mystic it is taught that all senses give pleasure to the body while the sense of smell gives pleasure to the soul. In the Sufi Way, each “state” is associated with a scent, and in the Semitic language the word “fragrant” is synonym to the word “good”, as if every good perfume necessarily comes from a good thing , and every good thing necessarily emanates a good perfume. As a conclusion of this we have the tradition of the “perfume of holiness” that emanates from pious people whose actions are virtuous (good). A perfumer from the industry has to learn his base notes, their molecular structure, the story of their utilization, their preferred combinations with other ones, their making process and their eventual toxicity. The Natural Perfumer also has to learn to know his base notes, his ingredients, the notes of his working instrument. Natural essences are a lot more complex than the singular synthetic molecules used by the industry of mass perfumes. The essential oil of plants is their vital spirit extracted through a basic process of Alchemy: distillation. Basic knowledge of Phytotherapy, our ancestral medicine, is indispensable to the knowledge of the essences because the medicinal properties of plants are most often due from the essential oil they contain. The traditional plant healer is able to understand their curative properties just observing them. Many are the clues; their shape, their growing, their reproducing, their preferred ground, their ideal climax, their reaction to aggressions and their perfume. The natural perfumer should arrive to this intuitive knowledge, smelling an essence he should understand its medicinal properties. He shall be able to do this only because he will use them daily not only to compose perfumes but also to cure himself, his family and his friends. In fact, practicing Aromatherapy is a natural conclusion for who composes perfumes with natural raw materials. Essential oils are material substances to be used in Aromatherapy in drinks, foods or massages, but they are also smells, immaterial fumes, vibrations, and their aromas have on us surprising effects. Who has not experienced, for instance, that the smell of lemon makes him salivate? Or lived intense emotions provoked by the smelling odors from his past? Does not each of us know how much bad smells can disturb us psychologically and how good ones can make us happy, like the aromas of food, of the forest or of the sea? The natural perfumer must learn the psychological properties of his raw materials, and he can do that only wearing them purposely to observe on himself and on others the effects they produce. This knowledge cannot be acquired except through personal experience and this could take a long time. Fortunately a number of people are conducting research in the field of olfactory psychology, and the study their conclusions together with one’s own observations based on personal use of the essences will allow him who threads the “way of Scent” not only to grow rapidly in knowledge, but also to contribute himself with new discoveries, because the field of olfactory research is an unknown ocean still to be explored. 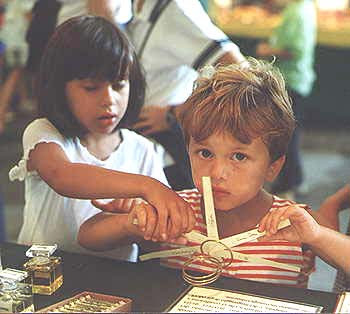 Olfactory research is not limited to the body mechanisms, it explores the infinite of human soul.